The Black Widow spider is one to be extremely cautious of. Knowing the basics is the first place to start to make sure you do not fall prey to this Sinister Sister. While the red hourglass shape on the underside of a black (sometimes brown) abdomen is the trademark characteristic of the Black Widow, not all have this marking. Some may have bright red spots or even no marking at all. Female Black Widow spiders are approximately a half inch long, 1.5 inches when the legs are spread. Males have about a quarter of the size of a female Black Widow body but with longer legs. Most often males have yellow and red bands and spots over their back. Male Black Widows are usually gray or brown and may or may not have an hourglass marking that is yellow or white. Widow spiders are found in temperate regions around the world: the U.S., Central and South America, Africa, Southern Europe, the Middle East, Asia, and Australia. That’s every continent in the world besides Antarctica. Black Widow spiders spin a very strong web (all the better to lure prey). Female webs are usually one foot in diameter, consist of crisscrossed silk threads, and a dense area of silk on which the female spider hangs belly up in the center. The Widow’s web is most commonly found close to the ground where it’s dark and sheltered. The Black Widow spins her web in sheds, garages, woodpiles, and under stones. The female Black Widow spider will mates in the Spring and in the summer months lay several egg sacs containing 100-300 eggs per sac. She suspends her whitish-tan and papery egg sacs from her web for approximately three weeks until 100 or so eggs hatch. Incubation lasts between two weeks and a month, but the Widow spider develops its sinister ways early in life: only around a dozen spiders remain at the end of the incubation period due to cannibalism. Female Black Widow spiders live from one to three years; males only 30-60 days. Black Widow spiders are definitely venomous. These spiders have the strongest venom of all arachnids that inhabit North America. Equipped with a deadly neurotoxin, a Black Widow spider’s venom is many times more powerful than that of a rattlesnake. What renders this spider unable to deliver a fatal bite however, is the fact that very little venom is injected within any given bite wound. If the spider were able to successfully inject larger quantities, it would surely kill you. 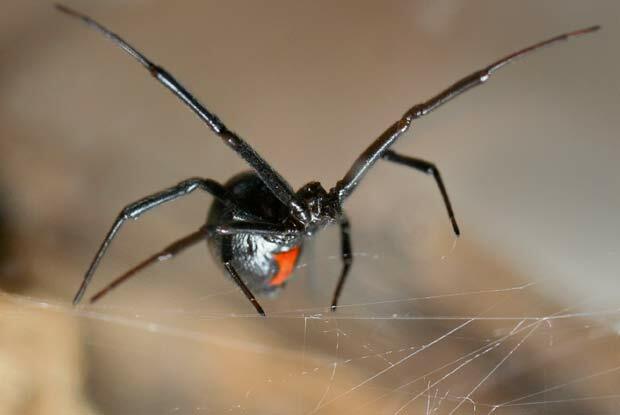 Severity of a Black Widow’s bite depends on many factors: where the bite occurred, how much venom was injected, and a person’s sensitivity to the venom (the elderly, young children, and infants tend to exhibit more serious symptoms). The Widow’s venom penetrates the victim’s bloodstream entering the nervous system. This triggers a series of systemic reactions including short stabbing pain, pain in the abdomen and back, severe cramping, nausea, sweating, difficulty breathing, fever, and restlessness. The bite will cause slight local swelling and two faint red spots from the fangs. Most symptoms last one to several days with prolonged or serious symptoms being very rare.